Is there a difference between the black cartridges used in an Epson LX300+ll and an LX-300+ printer? Ordering you replacement Epson LX-300+II ink cartridges online is fast and free here at Cartridge Save. We offer free next day delivery on cheap Epson LX300+II printer ink so the price you see is the price you pay! We pride ourselves on supplying top quality Epson LX300+II ink cartridges to every single customer. Regardless of the fact that our Epson cartridges are very low in cost, we offer a full money back guarantee on genuine Epson LX300+II ink cartridges to ensure perfect print performance. Our no quibbles return policy always guarantees that you get a high quality Epson LX-300 II ink cartridge or a full refund. Buy Epson LX300 II ink today and save money at Cartridge Save. Designed for businesses and offices with specific paper handling needs, the Epson LX-300+II is a 9 pin dot matrix printer that is reliable and versatile. This unit can handle a wide range of media, including envelopes, roll paper, labels, and paper with multiple layers. It uses impact dot matrix printing method and cheap ribbon cartridges. The Epson LX-300+II printer only works on old operating systems. This compact unit comes in a white enclosure and a dark transparent panel. 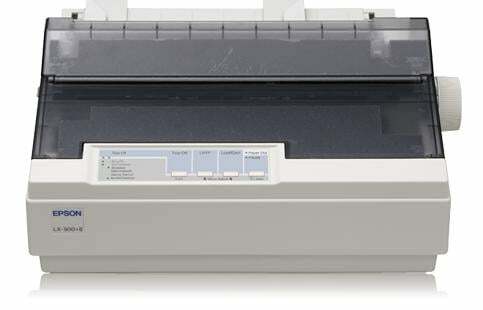 The Epson LX-300+II dot-matrix printer has indicator lights on the front and a plate knob on its right side. For connectivity, users may choose from a parallel interface or the USB ver. 1.1. Print speed can go as fast as 300 cps on high speed draft and 56 cps for near letter quality. The Epson LX-300+II impact printer is very easy to use and install. This simple unit is uncomplicated like modern printers and it has significantly cheaper consumables. This reliable Epson LX300+II forms printer delivers decent quality output at quick speeds. Ideal for use in limited spaces, the LX300+II is easy to maintain at a low-cost with its cheap Epson LX-300+II ink ribbons, although some of the consumables for the LX-300+II are in short supply. There are only a few dot matrix printers still available, as most have already been discontinued. The Epson LX-300+II does not work on Macintosh or newer Windows operating systems. It has limited connectivity options and only has a version 1.1 USB and a parallel interface. Laser printers and inkjet printers have already surpassed most of the capabilities of the Epson LX-300+II .